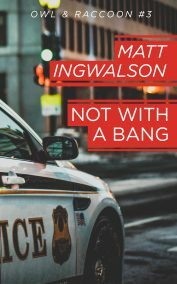 The Owl and Raccoon novellas of Matt Ingwalson update the impossible crime to a modern setting and, as I have said previously, are hugely recommended reading for anyone with an interest in a good story convincingly told. Ahead of the publication of the third story, Not With a Bang, I asked Matt if he would be willing to oblige us with an insight into his writing and he very kindly offered the following. The man’s nose had been broken and his teeth were bloody. He was looking into the cop car. And he was laughing at me. Why was he laughing at me? For a second, I couldn’t figure it out. I was on an overnight ride-along with the Denver police department. And a stabbing at a club had incited a legit riot. Hundreds of half-drunk club-goers had poured onto the street and for several minutes, our city was chaos. Lights flashing, siren on, we’d bounced up onto the curb. The officer had turned to me and said, “Whatever happens, don’t get out of the car.” And then he’d jumped out his door and into the mess. And now there was a man standing outside the car laughing at me. It took me a few minutes to put it together. He thought I’d been arrested. Suddenly the man spun and ran. Ran like everybody else was running. Because more patrol cars were pulling up, more blue uniforms were blocking off the street. And the night stilled and all that was left was evidence. Broken bottles and bloodspots. Eventually, the officer I’d been riding with came back, unlocked the door, and crawled in beside me. He said the detective assigned to the stabbing was about to walk through the club. Did I want to follow along? I slid out of the car and followed a sea of flashlights and flashbulbs over the asphalt, over the sidewalk, over the threshold towards the scene of the stabbing that had started it all. My first novella, The Single Staircase, had been inspired years earlier when I’d trudged upstairs to check on my sleeping newborn. I cracked the door to her nursery and she was gone. I blinked and there she was. Safe. My eyes just hadn’t registered her in the darkness. But that brief moment of panic burrowed into me. I couldn’t forget it. How could a baby disappear from a locked third-floor nursery? My favorite books were gritty American crime stories. (Think George V. Higgins, Raymond Chandler and James Ellroy.) But this seemed like a classic, locked-room Agatha Christie plot. And I started wondering if I could combine the two genres to answer the puzzle burning in my brain. And that’s how I found myself following an evidence collection team across a damn war zone into a bloody nightclub. While Owl and Raccoon #1: The Single Staircase was inspired by my fear of being a new dad, every other book in the series was born in the riot. All night, I scribbled furiously in my notebook, writing down bits of cop lingo and noting the color of station walls. I watched junkies scurry as we drove past corners at midnight. I smelled the drunks we had to transport to their holding cells. I ate in an all-night Chinese restaurant, chatting with other officers, listening as they talked about their families and complained about why they hadn’t made detective yet. The final ritual of the shift was called choir practice. All the officers who’d worked this long, late Friday night were going to gather in a parking lot at three a.m. to drink and decompress. But when the shift ended and we pulled back into the station, my friend told me choir practice had been cancelled. The riot had got everybody too stressed out or something. I shrugged and thanked him for the ride-along and got into my car. As I pulled out of the lot and onto a dead-dark street, I realized he’d been lying. I never pressed him on it. But I’m fairly sure that choir practice went on without me. I’d been allowed to walk right up to the line, seen a hint of things the good people of America don’t even realize exist. But there was one thing the cops just weren’t willing to allow. And I understood. And I didn’t feel mad or betrayed. I had enough inspiration to write a million books. And anyway, I was tired. And I was ready to go home. The third book in the Owl and Raccoon series, Owl & Raccoon #3: Not With A Bang, is now available at Amazon. Ingwalson is also the author of Sin Walks Into The Desert, which was named Shelf Unbound’s Best Indie Book of 2015. Genuine thanks to Matt for taking the time to do this, and I encourage you to check out the Owl and Raccoon stories from Amazon if you’ve yet to do so (and I’m not just saying that because he’s one of the few living authors I read). Also, be sure to check back later today for my review of Not With a Bang.